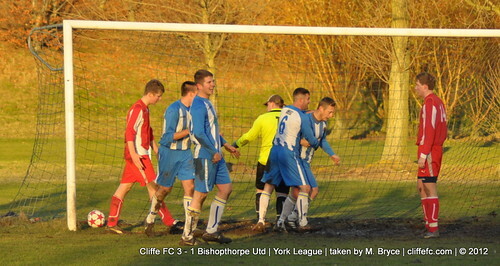 Cliffe FC take all three points in another competitive York League Division Two fixture. Finally something to smile about, the reintroduction of some familiar names, Hallam, Beckram and Rawson, added to the existing blend of old and new faces brought back the fighting spirit of Cliffe FC. We had to ride our luck a little in the early exchanges but we were up for the game and up to the task. 3 good points. More to come. Once again, Eggborough Sports Complex hosted the fixture as Oxen Lane continues to struggle with adverse weather conditions. This match, Cliffe FC’s first league fixture since October, began with Bishopthorpe having the better of the opening chances, hitting the foot of the post and calling Ally Harris into action in the opening 10 minutes. Cliffe opened the scoring on the 20th minute mark, a Tom Hogg header somehow ending up in the net, Hogg of-course claiming the goal but looked very much an OG, 1-0. Hogg made it 2-0 near the half-hour mark, timing his run and calmly knocking the ball past the on-rushing ‘keeper, 2-0. Ian Beckram’s return to the side was cut short, an ankle injury forcing Keith Tiplady into an unplanned change shortly before Cliffe extended their lead before the break, Tanton finishing from close range to see Cliffe lead 3-0 at the break. Bishopthorpe continued to compete well in a what developed into a bit of a battle between both sides as the pitch condition deteriorated. Harris was once again called into action, making a great close range save and dealing well with Bishopthorpe’s long ball threat. The away side did score to make it 3-1, a cannon of a shot flashing into the top corner. Both sides had further chances but the final score read 3-1. Tom Hogg was given referee’s man-of-the-match, but Layton Hallam deserves a special mention for his quality performance at left-back in his first appearance in the blue and white of Cliffe this season. Tiplady’s side face their biggest test of the season so far next Saturday, travelling to face early Division Two pace-setters, Fulford FC – who lie in second place behind league leaders Heslingten. Harris, Atton, Hallam, Tanton, Durnin, Beckram (Parker), Pears, Taylor (C), Dunning (Rawson), Carter, Hogg. Cliffe FC Goals: OG, Hogg, Tanton.